Ever since Google announced it was buying Motorola, industry watchers have speculated if Google was going to make Android a proprietary/closed source platform exclusively for Motorola's devices. That will never happen and here's why. Google's revenues from the mobile segment are currently derived from advertising, while Motorola's are from device sales through carriers and retailers. So let's compare how much money Google can possibly make over the next few years by following its open source strategy versus a Motorola-focused proprietary strategy. For the purpose of this analysis, I have taken very conservative estimates for Android revenues to emphasize my point. I have also restricted my analysis to smartphones, so the numbers are even more conservative. 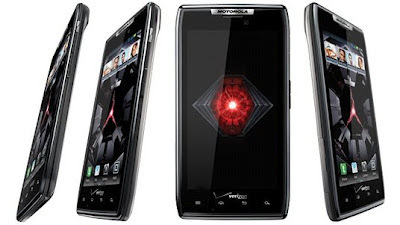 Average Selling Price - Motorola's average selling price has been estimated to be $226.30, by Forbes. However, this most likely includes sales of feature phones as well. So I have considered the average selling price for smartphones in the US, which is about $135, added to the average carrier subsidy of about $280. Gross Margin - Gross Margin is essentially the difference between the price at which Motorola sold a smartphone and the manufacturing cost of the device. Motorola's gross margins over the last few years have consistently hovered around the 25% mark, so that was a safe estimate to take. Annual Growth in Gross Margin - This annual increase in gross margin would be driven by increased prices, as following a proprietary strategy would most likely put Motorola's devices at a premium in the market. Average Revenue Per User (ARPU) - This is an estimate of the advertising revenue Google makes per year on every Android user. The details of this analysis are mentioned here. Annual Growth in ARPU - This is an extremely conservative figure, given that growth in ARPU is driven by growth in user base. 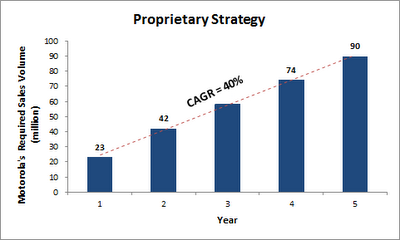 An ARPU growth of 10% is probably more realistic, but I've taken this figure to be on the safe side. Average Daily Android Activations for 2012 - Given that android activations have already reached 850,000 per day, it is a fairly safe assumption that they would surpass the 1 million mark this year. So I have considered an average figure of 1 million for the year. Annual Growth in Activations - This is an average growth rate in daily activations from 2012-2016. This, again, is a fairly conservative figure as daily activations have grown by more than 100% over the last year. This growth should be driven by a sharp increase in global smartphone penetration, which is currently around 30%. Active Android smartphones discarded - This is an estimate of the percentage of active android smartphones from the previous year that are discarded in the following year. This excludes refurbished, reused or re-sold phones since those would still be active android devices from which Google can earn advertising revenue. Just to add, and I'm sure this is fairly obvious; this number is much higher than any reasonable estimate. I have taken this figure to get an even more conservative estimate of advertising revenue. Based on the assumptions highlighted above, let's first have a look at Google's mobile advertising revenues from the Android platform, only considering smartphones sold from 2012-2016. 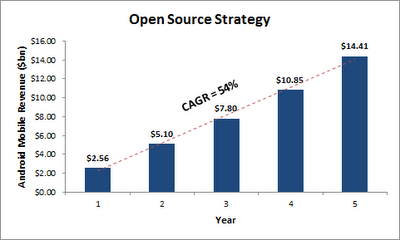 Wow, that is considerable growth from Google's current open source mobile strategy. Now let's have a look at the sales volume Motorola would need to achieve (taking into account both device sales revenue & advertising revenue from those handsets) to meet these revenue targets. This volume growth is much higher than any reasonable expectation from Motorola, considering their revenues over the last 3 years have mostly been flat. In addition to this, Motorola's marketing & distribution expenses (Motorola's operating margin is currently negative) would far outweigh Google's running expenses (including a mobile advertising revenue share with carriers & OEMs). Therefore, the actual expected volume growth could be significantly higher than this. Expecting Google to turn Motorola into another Apple-like success story, to just match a conservative estimate of their mobile advertising estimates is asking for too much. Google is many things, but a great consumer marketing company, it is not. It would make sense to sell Motorola's hardware business, as it would put other Android manufacturers at ease. There have been rumors of Huawei being an interested acquirer, and the deal would make sense as long as the valuation was acceptable. It might make sense for Google to hold on to Motorola for now, because Motorola owns some significant distribution relationships with retailers, carriers & cable TV operators, which could come in handy for Google. Google is making a major push into tablets & television, with the Nexus tablet & Google TV, and Motorola could help with that. This strategy carries the risk of alienating other Android hardware vendors, but considering the success and market penetration some of them have seen on the Android platform, it is not a very big risk. OEMs could always fork Android, like Amazon did, but there are some considerable risks with that strategy. Conclusion - This analysis is not exhaustive in any way, but it does highlight the fact that even though Google has a few options in front of it when it comes to Motorola, using Android as a proprietary platform on Motorola's devices is not one of them. Nice article. Huawei will not go through for obvious reasons and its just a rumour. There are couple of more rumours like this about selling Motorola's home business and top level management changes. But nothing will be clear till May 20th i.e before the acquisition is approved by China. Surely plans are in place from and you will see them getting implemented very soon. Some things will surprise you !!! I'm sure they will. I'm actually very curious to see what Google's plans for Motorola are and how they fit it into their overall strategy. Google cleared the confusion right from the day 0 of the acquisition that its not going to make Android proprietary for Motorola. Yes, I know. But that didn't stop people from thinking it made financial sense. And companies lie all the time when it comes to the best way forward, when it's based on financial decisions. That's why I thought this article was necessary to combat the speculation from the likes of Meg Whitman. Lets talk about simple mathematics. I don't know business. It makes sense to buy company B for 15Rs and sell it off for Rs 11 keeping patents for itself. It means you bought patents for Rs 4 only as against Rs 10 from company A which is very cheap and valuable too. How does it matter whether company B is using android or not? I will buy and trade with it. That's the state of M M I right now. You will see more of it !! I am in the middle of it !! Bang on! Except, it's important to manage stock market expectations as well. The stock price and hence the eventual sale price are all dependent on that for a listed company. If Google pulls that off, it could be a terrific deal! I think Google plan is to use Motorola to achieve there broader goal. Google cant achieve it with out there own hardware wing. Android can always be open and separate from Motorola (Google hardware wing) keeping it that way will not limit google/motorola to build ground breaking devices and create new markets, eventually other OEMS can emulate that. Its different thing that Motorola focus is different right know, Google can have motorola aligned to its strategies and chop of unnecessary divisions which might be sold to companies like huawei ..and keep moto's core expertise with it. Its only logical to think that Google was also interested in moto's hardware expertise along with its patents. If google was only interested in patents it could have licensed them with motorola, Moto would have happily agreed since it needs money anyway. That article is way too simplistic. The core question is "What kind of shareholder value can Google create with Motorola?". The problem is, that isn't an easy question to answer. Since, google's revenues are advertising-driven, Motorola's lower margins would definitely hurt in the short term. But in the long-term, can using Motorola Mobility indirectly generate meaningful shareholder value? If Google feels that they have enough to protect the ecosystem (& hence preserve shareholder value) then the decision would purely be driven by the valuation of Motorola. If someone offers them more than it is worth to Google shareholders (which is entirely possible), they would sell out. How Do you think Google can protect and grow its ad revenue? By putting in google services on most of all the electronic devices that connect to internet right now. Android/youtube purchase is one way of growing and protecting that revenue. Motorola purchase is also motivated by same agenda. Google will use Motorola to enter in to new markets, create new disruptive devices and market segments, enter in to living room, automobiles .. the possibilities are numerous. So google can force users to use its services (ads, chrome, gmail, wallet ..) in every part of the life, Ecommerce ..is big deal for google they want a device attached to every human being intellegent enough to figure out that he needs a haircut and suggest him closest barber shop or his shoes are old and he needs new pair of shoes and suggest him best deal in shoes available. If you have been following Google lofty ideas and thoughts you will understand that it cant achieve all this stuff without hardware wing that can commercialize this stuff at very low prices. If google will succeed or not its a different thing, but it will defiantly attempt to do this. and all the above stuff I have stated has nothing to do with android being open or proprietary. Google can use android to do this or use different platform altogether in long run. Look at google tv it is not android ..so there is no hardwritten rule that every device that google makes should be only based of android. The motivations for the Android/youtube acquisitions are entirely different from the Motorola acquisition. Android/youtube are services businesses that directly generate ad revenue for Google. If they had not acquired those platforms, those sources of ad revenue would have been foregone. Motorola, however, would continue to generate mobile ad revenue for google even in the hands of another manufacturer. This isn't a comparable situation at all. All of Google's ambitions can be achieved through hardware partnerships, like it has been currently pursuing. Motorola is not critical to that strategy. Where Motorola could be critical is distribution relationships. The core question, again, is how much shareholder value Motorola can create for Google, through those distribution relationships and if Google can maintain those if Motorola is sold. In any case, once China approves the deal, Google's strategy should become clear.